The Hillshire Brands sausage fight could have more sizzle in it yet. Tyson Foods offered $6.8 billion, including debt, for the maker of Jimmy Dean and Ball Park pork products on Thursday, topping Pilgrim’s Pride’s earlier $6.4 billion swoop. The U.S. meat-processing giant seems to bake in decent synergies and has a stronger balance sheet. But there could be more fat to trim from this hot dish. Too much, though, could leave both bidders burned. Tyson’s $50-per-share offer represents a 35 percent premium to Hillshire’s share price before Pilgrim bid $45 per share on Tuesday. Consumer food mergers generally produce cost savings equal to somewhere between 5 percent and 10 percent of the target company’s revenue. Take 6 percent as a conservative starting point, and Tyson might be able to squeeze out $240 million of annual savings, based on consensus analyst estimates for $4 billion of revenue at Hillshire this year. Taxed and capitalized, those might be worth $1.7 billion. That’s in line with the $13-per-share premium Tyson is offering. Hillshire’s stock was trading above the latest offer price on Thursday, suggesting investors expect more back-and-forth. Bump the synergies up to 10 percent of Hillshire sales, and a buyer could theoretically offer up to $60 per share – or $8 billion including debt – before they started to destroy value. But Pilgrim’s was already stretching its balance sheet to pay $45. Just equaling Tyson’s bid would push leverage up to an uncomfortable 4.7 times net debt to earnings before interest, tax, depreciation and amortization. Tyson, meanwhile, is willing to raise equity to finance some of its deal so that it can keep its credit rating. Even it, though, may find adding $1.2 billion to its offer a stretch. It’s possible that strategic considerations will trump financial logic. Hillshire, which was spun out of the old underpants-to-coffee conglomerate Sara Lee two years ago, is unusual among consumer food companies in that it’s focused on a booming market – protein. Yet it’s still small enough to be digested relatively easily. Pilgrim’s might struggle to find a better opportunity to diversify its product lineup beyond chicken. And the company’s controlling shareholder, Tyson’s larger rival JBS, has a reputation as a fierce cost-cutter. That may embolden Pilgrim’s to up its bid. There may be more life left in this food fight yet. 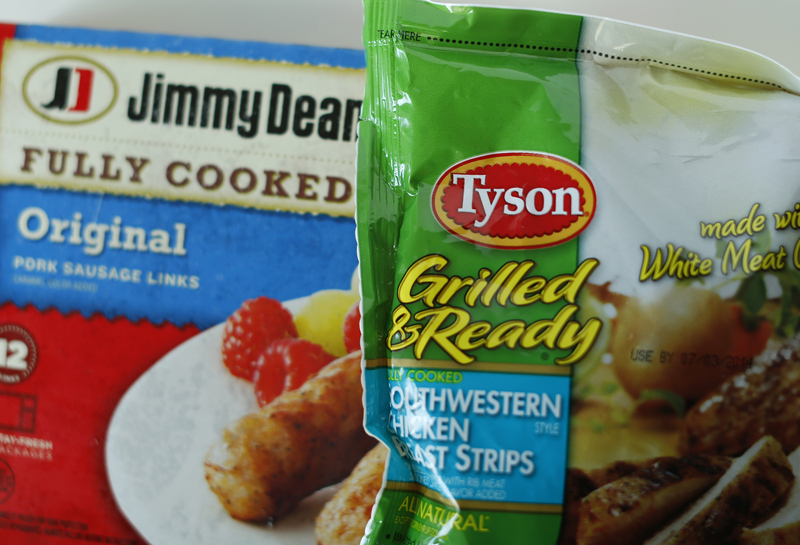 Tyson Foods, the biggest U.S. meat processor, entered a bidding war for Hillshire Brands on May 29 by offering to acquire the breakfast-sausage maker for $50 per share. The proposal, worth $6.8 billion including the assumption of Hillshire debt, topped an earlier $45-per-share offer for the company by Pilgrim’s Pride, a U.S. poultry producer. Hillshire, which makes Jimmy Dean breakfast sausages and Ball Park hot dogs, announced its own $6.7 billion deal to acquire pickles-to-pancake-syrup maker Pinnacle Foods on May 12. Both the Pilgrim’s and Tyson offers are contingent on Hillshire dropping that deal.